IF you’d wound the clocks back a decade and sent Slaughtneil out in black and amber stripes, they couldn’t have been any more like Crossmaglen if they’d tried. At their pomp, Cross were at their absolute best in encounters like this. These teak-tough battles in the lashing rain and howling wind, darkness long descended. There has been never been a club side as good in battle, but this back-to-back chasing side from the foot of Carntogher are pushing at the boundaries. 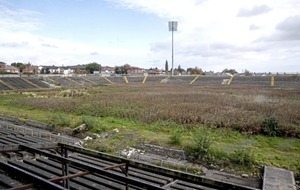 It’s a long, long road to ever match the Armagh club in terms of silverware, and no side ever will in all likelihood, but if there was a DNA test done at 9pm on Saturday night, it would have been a 100 per cent match. Omagh boss Paddy Crozier agreed: “They’re a brilliant team, and I’ve said it over the last year and nine months, they’re getting better. While it's far from a given that they will win Ulster again, yesterday's removal of Scotstown, the one team in the province that's beaten them in the last four years, only seems to strengthen belief that they'll retain the title. But this was a serious test. They were uncharacteristically rash in the first half, kicking ten wides and leaving themselves just a point ahead at the break having played with the wind. In the second period they lost leader Chrissy McKaigue to a black card midway through and were twice back clinging to that one-point lead, but it was never surrendered. The spectacle wouldn’t have won any beauty pageants, but it was never going to. Omagh were a side perfectly set up with all the tools to frustrate the reigning champions. This was how it was always going to be. At times in the first half, all 15 white shirts were inside their own 45, although they did largely keep Conor O’Donnell up the park. And if one man didn’t deserve to have his brilliant season cut short, it was him. 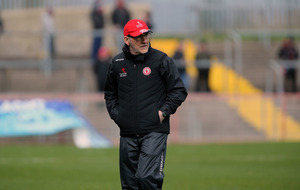 If Mickey Harte was having doubts about introducing him to the Tyrone setup, then to see how he took Brendan Rogers to task. The man with the telescopic arms couldn’t get using them as Omagh’s number 14 used his hips as effectively as his head to win ball after ball. Two points from play was as much as anyone managed in a low-scoring affair but it was O’Donnell's ball-winning that brought St Enda’s up the pitch into the teeth of the wind. It took seven whole minutes for the deadlock to be broken by Christopher Bradley, but a couple of uncharacteristic wides were symptomatic of a half in which Omagh’s plan worked to near perfection. Slaughtneil did lead by 0-4 to 0-0 after 12 minutes, with the tactical move of putting Padraig Cassidy to centre-forward having great early effect as he took the game to Conor Meyler. But the Tyrone county man settled and began to influence, and after 15 scoreless minutes they hit three on the bounce, the pick of them from roving full-back Hugh Gallagher. 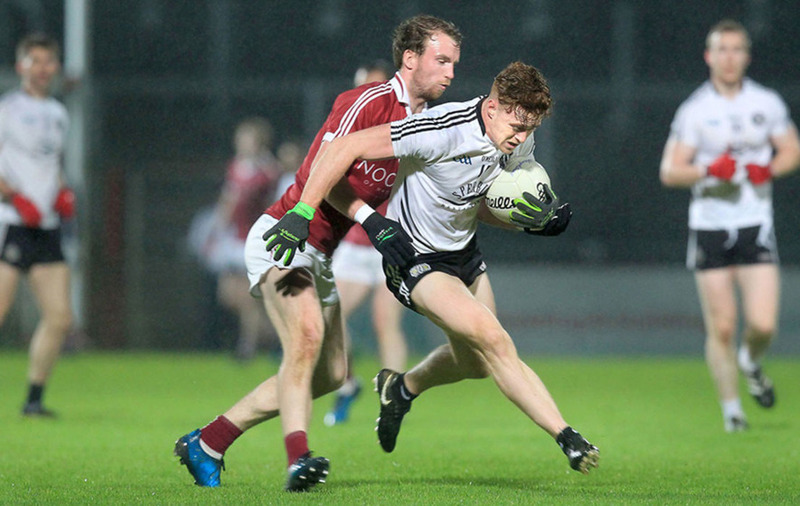 With Omagh’s kickouts starting to settle, Conor Clarke levelled it at 0-5 apiece with a cool finish right on the half hour, but Sé McGuigan gave the Emmet’s a clutch of something heading for an unusually fiery changing room. Mickey Moran read the riot act and just when you were thinking that Slaughtneil’s dual players would have nothing left in the tank, they found their gear. “He [Moran] was just angry in that we didn’t work hard enough and didn’t take the right options. That was basically it, those couple of things,” said John Joe Kearney in his understated way. It looked all set up for revenge, and within seconds of the restart there was a key moment involving the Omagh goalscorer from that provincial final in 2014. Barry Tierney burst through on goal off Cormac O’Neill’s pass but blazed high and wide of Antóin McMullan’s goal. The miss was compounded when two Shane McGuigan frees allowed Slaughtneil to wrap their hands around the game’s neck and squeeze tight. Holding a one-point lead was never going to do, but from three up it rarely looked like the Tyrone champions would steal it away. “We were concerned, a point in it going out to play against that breeze,” admitted Kearney. “Although the breeze wasn’t a real big factor on the game at all. We’d always opt, if we win the toss, to play against the breeze. We were comfortable enough coming out against the breeze. The one stage that Slaughtneil looked under serious threat was when Chrissy McKaigue got the line for hauling down Conan Grugan as he was about to pull the trigger on a goal chance. Ronan O’Neill tapped over the free to cut the gap to one, 0-8 to 0-7, but the seven wides they kicked in the second half were to prove costly. Joe McMahon briefly went to full-forward at both ends of the half but to no effect, and Slaughtneil would be fairly happy with how their tactic of pushing Keelan Feeney right up on him worked out. Karl McKaigue’s mastery over Ronan O’Neill helped as well, but a lot too owed to their sheer athleticism and desire in the second half. Having struggled to create options for short kickouts in the first period, they won 11 in the second half. There wasn’t the same nervousness about their display of keep ball as against Kilcoo, and Shane McGuigan’s fist-pumping reaction to the free that made it 0-10 to 0-8 said enough about its significance. The last 13 minutes of football were scoreless as the maroon shirts put on a masterclass in keep ball, sucking the life from the frustrated Omagh challenge.